Formulated with low-odor, water-soluble resins and high-quality pigments, MTN Water Based Spray Paint is great indoors and out. Spray it on canvas, glass, wood, metal, EPS foam, and more. Montana Colors Water Based is water-resistant when dry and has a matte finish. 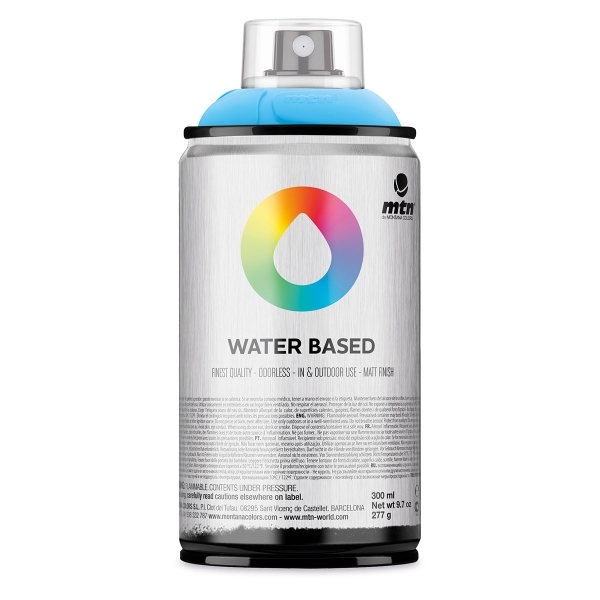 Use this versatile, fast-drying spray paint for graffiti art, fine art, and decorative arts and crafts. The 300 ml cans come with a pocket cap nozzle. Other spray caps are sold separately. The smaller 100 ml cans are a great size for young artists. Workshop Pack of 6 — A great intro to the line, with six basic colors to get you started. The set includes 100 ml cans of Brilliant Green, Cadmium Yellow Medium, Carbon Black, Naphthol Red, Prussian Blue, and Titanium White. 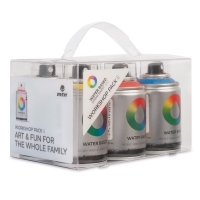 Workshop Pack of 16 — An expanded palette of MTN Water Based colors. 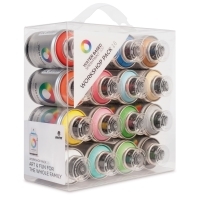 This set includes 100 ml cans of Azo Orange, Blue Violet, Brilliant Green, Brilliant Light Green, Cadmium Yellow Medium, Carbon Black, Naphthol Red, Naples Yellow, Neutral Gray, Phthalo Blue Light, Prussian Blue, Quinacridone Magenta, Quinacridone Rose, Raw Sienna, Titanium White, and Turquoise Green. 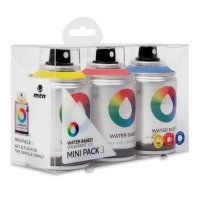 RBY Mini Pack of 3 — This set includes 100 ml cans of Cadmium Yellow Medium, Naphthol Red, and Prussian Blue. 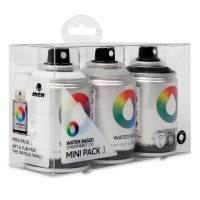 BWG Mini Pack of 3 — This set includes 100 ml cans of Carbon Black, Neutral Gray, and Titanium White. ® MTN is a registered trademark.